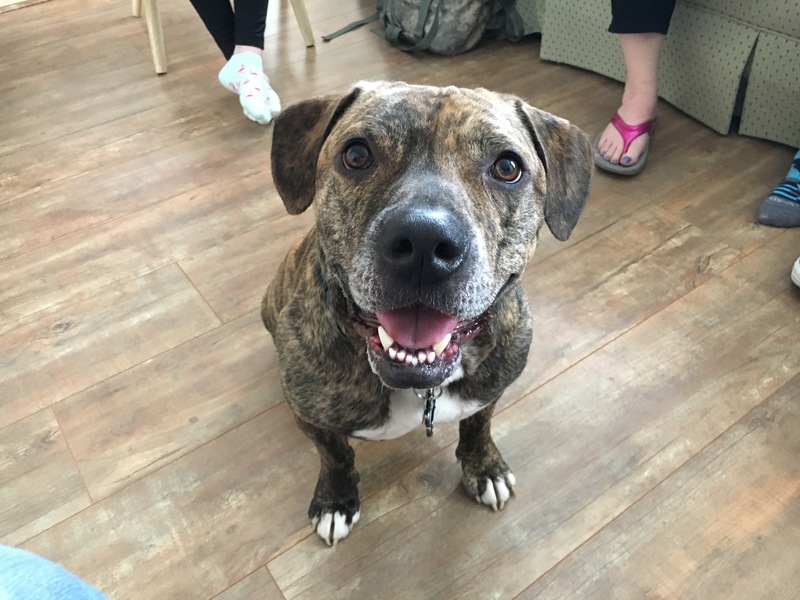 Barney is a three-year-old Plot Hound / Boxer / Pit mix who lives in West Omaha. His guardians set up this dog behavior training session to stop Barney from charging the door and displaying territorial behavior at times when in the yard. I got a first hand look at Barney’s door behavior when I arrived for the session. Now in the moment, you have to do what you have to do if your dog is reacting in an unwanted way. But any time you pull a dog backwards, it activates their opposition reflex and can actually increase their reaction and cause them to pull forward. As a dog behaviorist a common problem I see with my clients is neglecting to train a dog how we want them to behave in various activities. Instead, people often try to teach their dog in the moment which is about the worst possible time as the human is doing other things and unprepared. By staging or recreating a scenario, we can reduce the intensity of the elements and provide the dog with a safe place to learn. If it makes a mistake, we can back up and repeat that step until the dog understands what we want and is displaying the dog behavior we want. This seems so obvious, but the overwhelming majority of my dog behavior clients never even consider this as an option. One of the ways I help dog guardians is by showing them how to add discipline or structure to repetitive activities or tasks. Dogs need a lot of repetition to learn. By adding a little extra step to repeating tasks, you can do a mini dog obedience training session each time you do that activity, without even thinking about it. An example of this is to train a dog to sit at the door before we open it. The next step is to train the dog to stay in a sit when the door is opened and wait for permission to go through. I showed the guardians how to train the dog to behave this way at the back door in the video below. This may seem like a simple exercise, but by repeating it over and over, every day, it will help Barney get into a habit of asking for things and paying for them with obedience. I showed the guardians a few ways to add a little bit of structure to petting them. I like to call this passive training and its one of the easiest ways to use positive dog training to teach a dog to behave how we want them to. To give the guardians tools to redirect him, I showed them another positive dog training exercise; learning to focus. Barney caught on right away and was looking up at whoever was conducting the exercise within minutes. Because we covered so much ground, I didnt get a chance to get too deep into a Stay exercise. Training Barney to Stay is something I really want the guardians to practice every day as it will help him develop self control and give them a valuable tool that will come in handy over and over. I promised to share a few links to the technique I use. I break training dog to stay into three categories; duration, distance & distraction. I tried out a few additional exercises with Barney, but they were more advanced than he was ready for and when he started to push back, I pulled the plug. It had been a long day for Barney and his guardians skipped his normal exercise so I could see him in his most challenging state. Not the best scenario to push the limits. Because Barney pushed back on the normal door answering technique I use, I would like to see the family practice the same procedure I walked them through in the first video. Have Barney on a leash before the person arrives (It will help if the person is scheduled to come at a set time or texts ahead of time so the family isn’t caught by surprise). Once Barney rushes the door, the family members can use the leash to walk him back to the spot on the floor furthest away from the door, but still within visual range of the door. Barney should be made to sit and wait in that location while another family member answers the door. The guest should be quiet and avoid any sudden or big movements. Once Barney is sitting without pulling or reacting, only then should the person take 1-2 steps towards the door. Its important to not let the dog pull towards the person. After the 1-2 steps, they should place Barney into a sit again and wait for him to be calm before taking another 1-2 steps. This will take a minute or two so it will be wise to arrange to have a friend or relative play the part of a guest. Once Barney gets close to the guest (but still slightly out of reach), the guest should casually turn sideways, crouch down and hold out their hand towards him with a treat in their palm (palm facing up). If Barney is calm and not pulling, the handler should then allow him to get the treat. This process will be helped by having the family practice having Barney go to a place on the back wall when there is no guest present and get a reward while hearing a specific command word similar to what we did for the bed training exercise. It will take a lot of practice, but by blocking Barney from charging the door and replacing it with this more structured approach that also incorporates positive reinforcement, it shouldn’t take long before Barney stops charging the door without being on the leash. Ideally, Barney should practice this at least once a day for 2 weeks (more practice will accelerate his progress). We wrapped up the session by filming what I call the Roadmap to success. But after reflecting on the session afterwords, I decided to dial things back a bit so we shot another roadmap which you can watch by clicking the video below.